English: Fate/Kaleid Liner Prisma Illya: Dance at the Sports Festival! Tatsuko of class 5-1 is really excited about the upcoming school sports festival, her proposal for a new "Eel Scooping" event is less than enthusiastically received though, especially by Suzuka. Illya mentions the main event dance to Miyu, and as teacher Taiga Fujimura points out, it entails a huge reward, but will require quite a bit of practice. And so the close friends: sarcastic Nanaki, level-headed Suzuka, excitable Tatsuko, energetic Illya, shy Mimi, and reserved but athletic Miyu are off to win the dance event for the honour of their class and for Fujimura, who seems to have some saucy bet going on that she most definitely needs to win, or so the girls misunderstand. What is there to even say? We get more loli goodness in the form of a sports festival. As always, Miyu has trouble grasping non tangible concepts and thus needs Illya's help. The story doesn't really matter so much as the end result of the episode. Art and Sound were great as always, plus we got a nice but small amount of character development for Miyu. 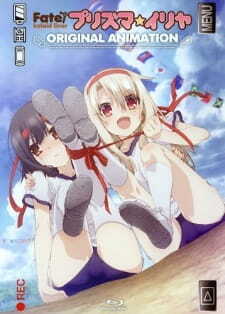 I highly enjoyed it because its more loli goodness without the drama mixed in. I mean, how can you possibly say you didn't enjoy it when it gave birth to this amazing thing?